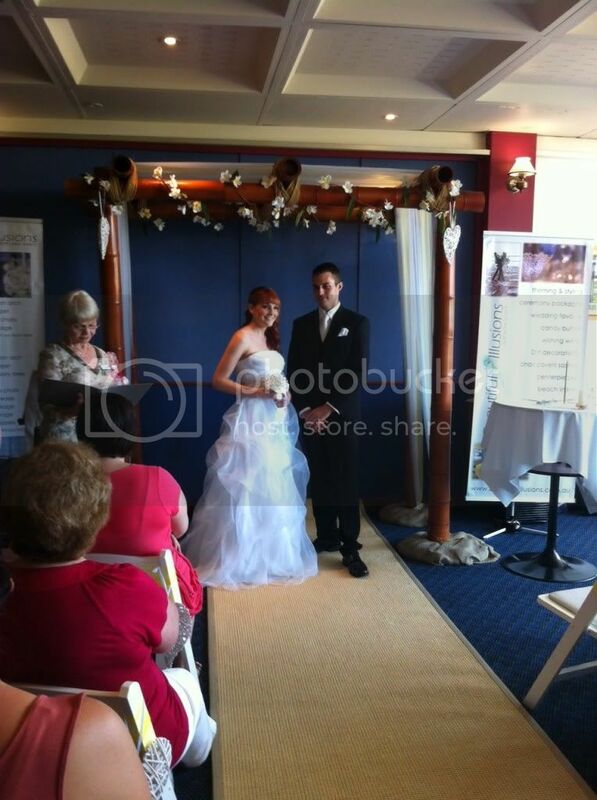 Our first Wedding Expo - The Bayside Bridal Fair 2012 at the Wynnum RSL was on Sunday! The boutique fair saw over 100 brides come through the door and it was great to meet and chat with the new brides and the odd groom that had made the journey! We had a lot of centrepieces on display and also some items from our great range of guest books, wedding favours and champagne flutes. The RSL was nice enough to let us setup our big bamboo arch and our new seagrass runner in a lovely ceremony setup. The ceremony was used to host a mock wedding ceremony twice during the day and people got to experience the beach style setup. The bride looked stunning dressed by Rebecca from Penny Lane Bridal with hair and makeup by Judith McGoldrick and a beautiful beaded bouquet by Mad Monnie. The groom looked handsome dressed by Paul from Ferrari Formal. The groom walked the room offering the brides to be sushi while they were able to taste the champagne the RSL had on offer! They were also able to taste the flavours of cake with samples from The Cheesecake Shop. We were particularly impressed with the beautiful ice sculptures by Angel Ice Sculptures which were absolutely amazing! We had a great time mingling with the other exhibitors and seeing their skills and we thank everyone for the lovely comments we received on our own products. We will be on display again this coming weekend at a local wedding expo at the Redlands Boat Club at Cleveland. If you are thinking of attending a bridal expo then remember the following things... if you get there about an hour and a half before it ends then you beat people packing up however vendors will have more time to talk to you and you are just in time for the cakes to be cut up so they don't have to take them home...yummmmm. This entry was posted in Wedding Expo and tagged Ferrari Formal, Mad Monnie, Penny Lane Bridal, The Bayside Bridal Fair, The Bayside Bridal Fair 2012, The Cheesecake Shop, Wedding Expo, Wynnum RSL. Bookmark the permalink.